Say farewell to the single use plastic baggies with these reusable silicone food storage bags. 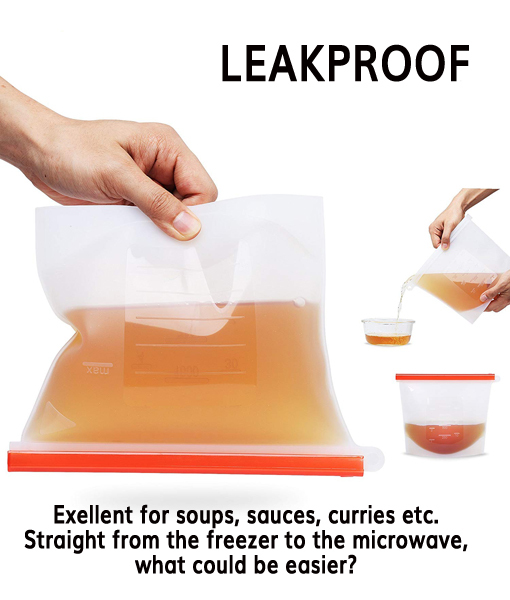 Made from food grade silicone, they are suitable for liquids or solids and can be used in the freezer, microwave and oven! 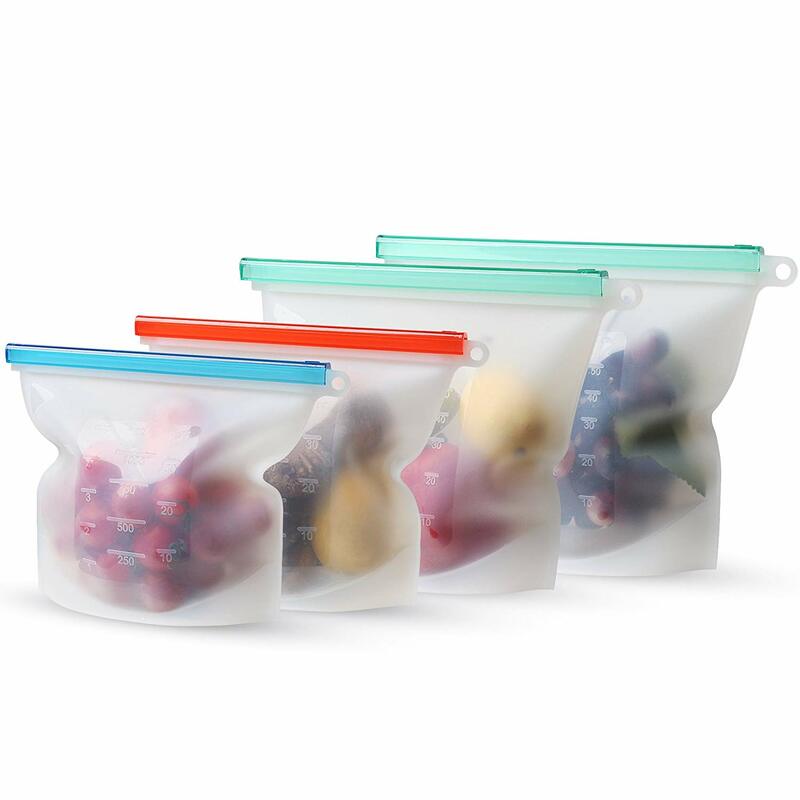 Leakproof, BPA free and easy to store…bye-bye baggies! ECO-FRIENDLY, RECYCLABLE, AND SAVES YOU MONEY – Never waste money on plastic bags again!!! 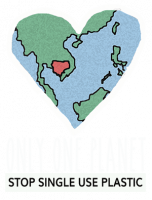 These reusable food bags provide a solution that you can wash, rinse, and reuse to your hearts content! They are a one-time purchase that will last you years, just wash and reuse to help the environment by never using plastic bags again to store your food and drink. 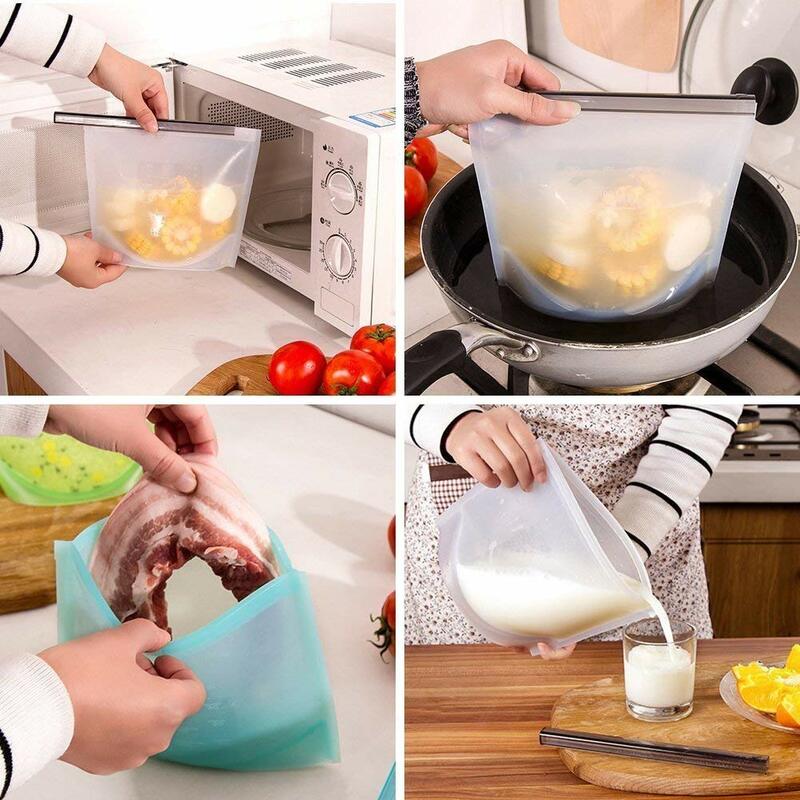 PRESERVE YOUR FOOD FOR LONGER – Never again will your food be stale or go bad in a plastic bag!!! Our hermetically sealed silicone food bags are non-reactive, non-allergenic, non-toxic, hygienic, vacuum air-tight containers. 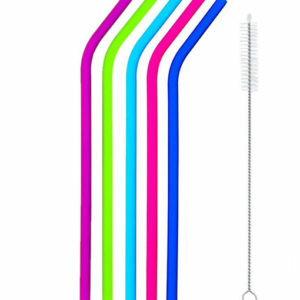 This means whatever food or liquid that you place inside, will last longer and stay clean without being contaminated. PERFECT for storing sandwiches, meat, fish, soups, stews, milk, juices, snacks, fruits, and vegetables. 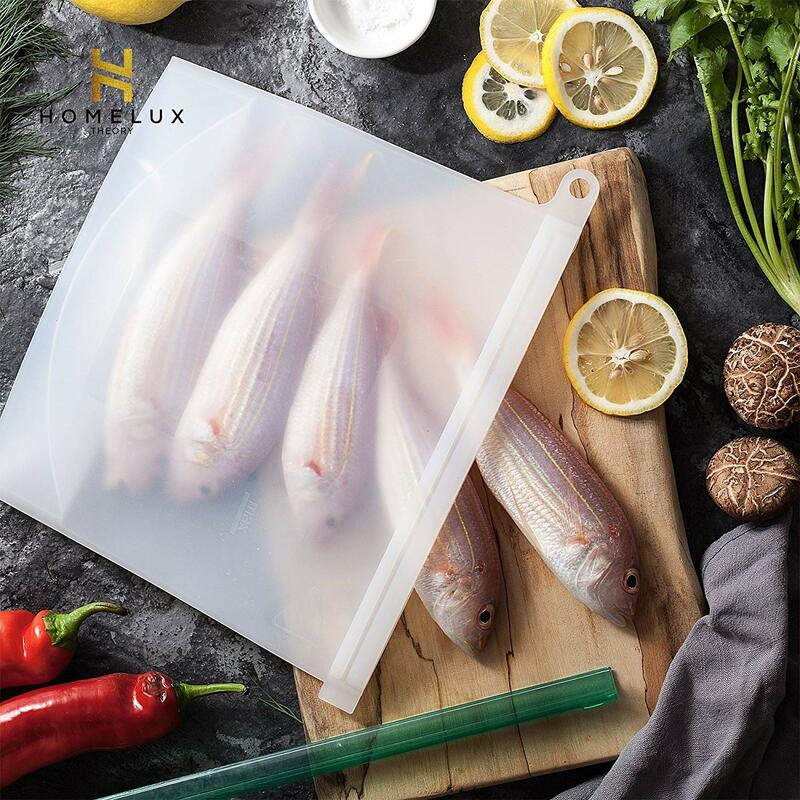 IDEAL KITCHEN BAG -Temperature Resistant: Heat and cold resistant, -58℉~482℉. 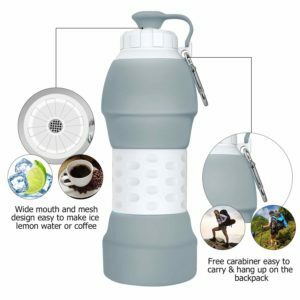 Can be safely used in microwave oven, refrigerator, toaster, freezer, and are dishwasher safe. 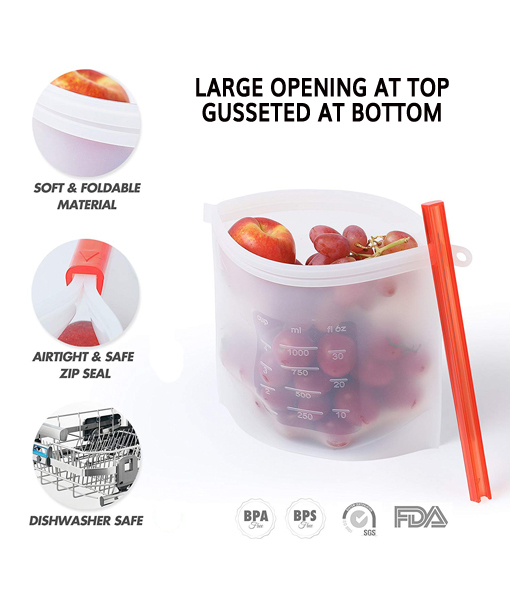 AIRTIGHT SEAL AND LEAKPROOF – Leakproof vacuum and zip-locked container that can store all kinds of solids and liquids without spilling. Hermetic seal to store liquids or solids. AVAILABLE IN TWO SIZES for all your storage needs. FDA & SGS APPROVED FOOD GRADE SILICONE which does not contain any fillers, coating, BPA, BPS, BPF, PVC, phthalates, or any the chemicals which can be dangerous to your health when they leach into the food. **Note that the plastic bar must be removed before using in the microwave or oven! 1000ml / 34oz., 1500ml / 50oz.